Workforce refers to the number of employees working in an organization. A well-trained, self-motivated and skilled workforce is much more important than end products or services, and goal-setting. Workforce consists of the organization’s employees from entry level workers to higher level executives. It is essential to devise good many useful measures to nurture the employees who man a business or organization. An effective workforce helps business thrive financially and socially. Effective workforce means a workforce which is flexible, adaptable, self-driven, welltrained, and skilled. Earmark the challenges that the organization faces and identify goals. Set a plan and write the vision of the business. Decide the time and substance of new recruitment. Design a compelling job ad. Create awareness about job opportunities across the broad spectrum of job market. Arrange for assessment test and effective interview of the possible recruits. Communicate effectively about what your company is and what you expect from the entrants. Select the most viable employees who can help achieve the goals of the organization. Provide effective on-the-job training and skill refreshment to the new recruits. Have an appropriate performance appraisal system in place. Act as an armor for the employees in their professional crises. Offer benefits to the newly recruited employees they deserve. Facilitate reward and recognition for good performance. Set promising career prospects for the employees, both new and the old. Retain talent to the extent possible. 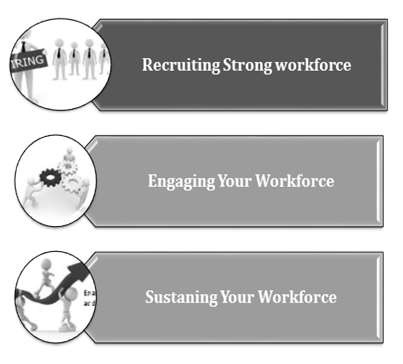 How to Build Strong and Effective Workforce? Effective workforce is the key to survival and success of the organization. It can be achieved through the measures which are discussed above. Following are the three broad measures through which an organization can maintain an effective workforce. Strong workforce is the pillar of an organization, in fact, the lifeline of every business. How can an organization function without effective human resources? Therefore, recruiting befitting employees is a cardinal step that every business requires. Identify the needs of business or the type of manpower needed. Resort to effective manpower planning. Decide when you have to hire or recruit. Decide whether the vacant posts need to be advertised? Spread awareness about job opportunity or approach existing employees. Clearly communicate the organization’s objective, mission, and vision. Always try to engage employees to increase profitability and productivity of the organization. Following listed points can help improve engagement with your workforce. Build trust among your employees. Sustaining or retaining workforce is the typical task for every organization. Following are some important points that can help in this regard. Protect your workforce from potential crises. Create a socially responsible culture. Effective workforce is a vital asset of any organization. It enables the organization to meet organizational objectives. It maximizes profit through enhanced productivity and efficiency. It ensures long-term success for the organization. It helps in evolving prudence in budget as it checks losses or underutilization of both man-hours and other resources of the organization. It assures the desired growth of the organization.